This sculpture shows a celebration by the fauns (male followers of Dionysos) and the Bacchantes or Maenads who were women followers of Dionysos frenzied with wine that rushed through woods and mountains swept away in a fierce ecstasy. They celebrated his orgies with drunkenness, nakedness, singing and sacramental feasting. The Gods of Olympus loved order and beauty in their sacrifices and their temples. The madwomen, the Bacchantes, had no temples. They went to the wilderness to worship. There was much that was lovely, good and freeing in this worship under the open sky and yet alway present, too, was the horrible bloody feast. 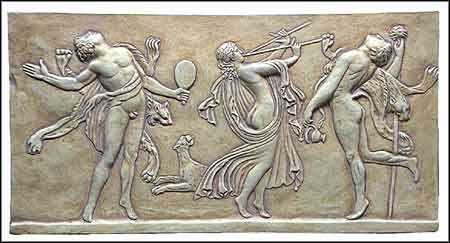 The worship of Dionysos was centered in these two ideas so far apart-of freedom and ecstatic joy and of savage brutality. The God of wine could give either of them to his worshippers. Throughout the story of his life, he is sometimes man�s blessing, sometimes his ruin.